The best part: Anyone who paid more than $695 for the phone will be refunded the difference if the Indiegogo campaign succeeds. Canonical hopes to raise $32 million (about £20.8m, AU$35.1m) in crowdfunding for the phone, and with 14 days remaining the company has almost $24 million (about £15.4m, AU$26.4m) to go. The company probably hopes the new, simpler pricing scheme will help with that - previously there were multiple price points, each with limited supplies so that latecomers would have to pay more. "You wanted a more affordable Edge, and now you've got it," Canonical wrote on the Edge's Indiegogo page today. Canonical revealed that interest from component supplies has allowed it to lower the cost of producing the phone, and that one of its "Enterprise bundles" - which includes 115 devices for $80,000 (about £51,000, AU$87,000) - was purchased by Bloomberg. "So of course we're passing those savings on to you," the company continued. "The target is still $32 million, so we will need to ship a few more phones at $695 than we would at a higher price, but we believe we can do it. We have two weeks, and we have the best community out there, so let's get to work: share this news, get the word out, and let's get the Ubuntu Edge made!" The Ubuntu Edge attracted more than $5 million (about £3.2m, AU$5.4m) in the first few days of funding, but its campaign seems to have slowed since then. The Edge is designed to be more powerful than anything on the market today, including flagships like the Samsung Galaxy S4, HTC One, iPhone 5, LG G2 and Lumia 928. Its specs aren't set in stone, but if the phone is made it's expected to pack 4GB of RAM, dual LTE receivers, 128GB of storage and a 4.5-inch display made of pure sapphire crystal rather than glass. 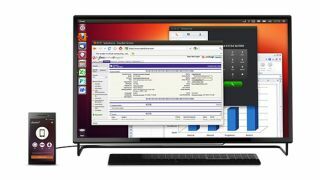 The Edge can also transform into what Canonical claims is a fully functional Ubuntu PC when connected to a monitor. The company currently plans to make just 40,000 of the high-end Ubuntu Edge smartphones, with other, low- to mid-tier phones running Ubuntu possibly coming afterward. As of today it's got more than $8 million (about £5.1m, AU$8.8m) in funding, leaving a long way to go before its goal is met. Don't miss TechRadar's interview with Canonical founder and Ubuntu Edge mastermind Mark Shuttleworth.